When producing a work of art as an homage to something that came before, there always exists the danger of the new product doing the job a little too well. It could very well be that the new product perfectly matches its inspiration beat for beat, yet it still feels hollow because it’s missing a soul of its own. 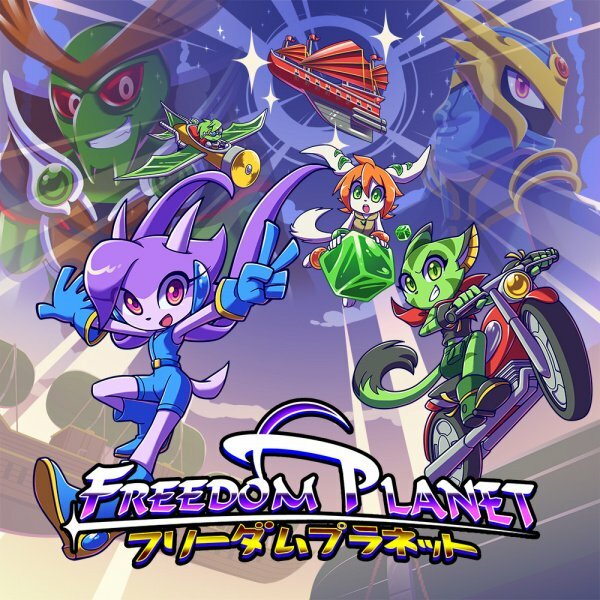 Fortunately, Freedom Planet doesn’t fall into this pit; though it’s exceedingly obvious that this new release has drawn heavy inspiration from the classic 16-bit Sonic the Hedgehog games, it instils the familiar formula with new ideas and characters in such a way that it sets itself apart and establishes its own identity. 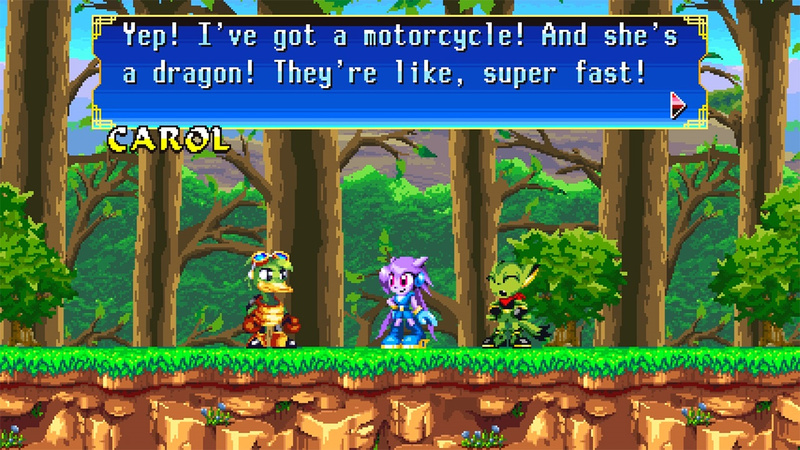 The story of Freedom Planet is intriguing, even if it isn’t particularly well executed. The plot ultimately revolves around a MacGuffin called the Kingdom Stone, an artefact imbued with fantastic power, being chased by the protagonists, two aliens, and the leaders of three nations native to the planet. The majority of the story beats unfold across voice-acted cutscenes which play between the stages, and though the heavier focus on story is an interesting experiment for this sort of game, it doesn’t pan out all too well. The quality of the voice acting is unfortunately all over the place, with some performances being genuinely great and others being cringey at best, and this inconsistency can be rather jarring mid-scene. What’s more is that the story focus feels ill-fitting in a game focused on high-speed action platforming, although this gripe is mostly solved by the inclusion of a “Classic” mode. At the start of a save file, players are given the option to either play the game in “Adventure” mode — with all cutscenes enabled — or Classic, which just stitches together the levels one after another with no breaks between. It’s a nice compromise, one which ensures that players can get as much or as little story content as they prefer. Gameplay is based heavily on the format pioneered by Sonic the Hedgehog in his glory days, but with some tweaks and additions that build something new with it. Levels are laid out with an unusual amount of verticality for a sidescrolling action game, with multiple different ‘tracks’ existing throughout; there are so many unique routes one can take to reach the end of a level, and they intersect and overlap each other at frequent intervals. It’s encouraged that players go through these levels fast — which is supported all the more by the momentum-based physics and a timer in the corner — so the emphasis is placed more on the player replaying stages multiple times both to learn all the routes and to understand the quickest way through them. Enemies are dotted throughout the stages, of course, but they interestingly don’t deal any contact damage; unless the enemy explicitly tries to attack you, you can just run right through them. It’s a weird choice at first, but one that makes more sense upon deeper thought, and it certainly goes a long way towards making levels flow much better. 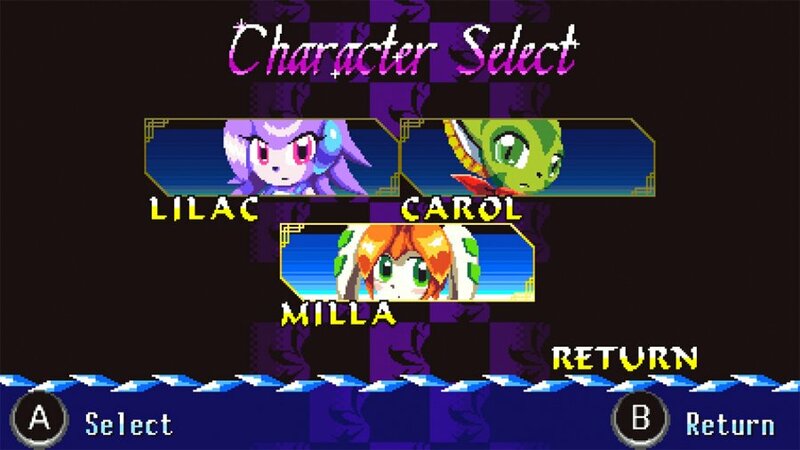 Your default character is a little purple dragon named Lilac, though you can also choose to play as Carol when starting up a file, and more characters are unlocked later. Each character has their own move-set to help make their run distinct; for example, Lilac has a boost move which in some ways mimics the spin dash, while Carol can climb walls and ride a powerful motorbike in certain circumstances. The characters hit that sweet spot of feeling familiar enough that they can be easily tried out, yet distinct enough that they make the next run feel fresh, and this individuality is only further hammered out by each character getting a unique level built around their abilities when running through their story. Though the emphasis is on fast motion, there’s certainly more scope for exploration than one would perhaps expect. Levels are complex and expansive, and each one hides a number of special collectable cards which carry over between saves. Each card unlocks something in the game’s main gallery, whether it be concept art, audio tracks, or other unlockable goodies; it’s always exciting to go back to the gallery after collecting several cards to see what you got. Finding every card will test your abilities with each character and ensure you’re intimately familiar with the layout of each stage, heavily boosting the game’s replayability while giving you a solid and tangible reward for your efforts. 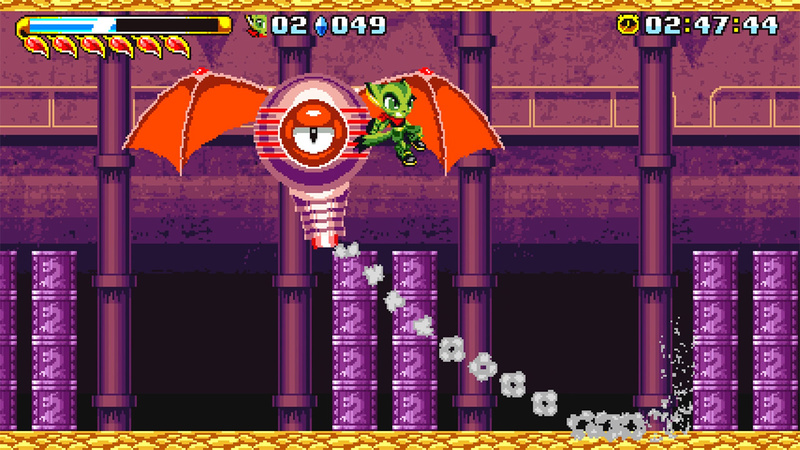 One area where Freedom Planet occasionally comes to a screeching halt, however, is the boss battles that punctuate each level. Unlike your typical Eggman encounter, these fights can be seriously difficult, often feeling wildly off-pace with the difficulty curve that the levels set. Though they aren’t all this way, it’s not uncommon for a boss to kill you in just a few hits, leading to many trial and error situations where you have to burn through several lives just to figure out how to best dodge and strike your enemy. 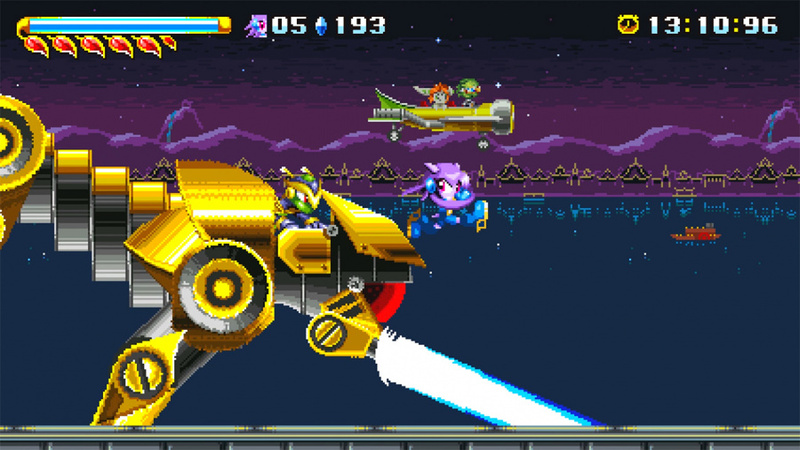 Even so, many of the bosses are gorgeous and inventive set pieces that are some of Freedom Planet’s most memorable moments; thankfully, the game is quite forgiving in its checkpoint usage. As for its presentation, Freedom Planet does a fantastic job of emulating the visual style of games from the days of the Sega Genesis, but embellishing that style where needed to bring it up to modern standards. Stages are rife with detail and packed with a deep and broad colour palette, finding that perfect balance where things look great both when you stop to take a closer look and when you rush past everything at the speed of sound. Roughly speaking, this is exactly how you remember Genesis games looking; Galaxy Trail has done a great job with the art direction. Right alongside this is the soundtrack, which mixes together retro sound elements with rock and roll to make for a high tempo sound that perfectly matches the intensity of the action on screen. Freedom Planet may have started as a mere Sonic rip-off, but to view the game as nothing more would be an enormously reductive judgment. 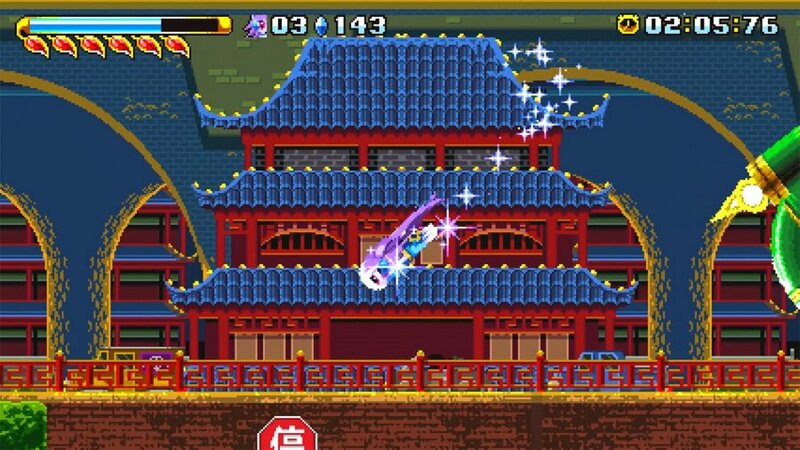 Despite its ho-hum story and occasional difficulty spikes, Freedom Planet manages to rise above and become more than the sum of its parts, imbuing a well-trodden gameplay style with fresh ideas and concepts. We’d recommend that you give Freedom Planet a try, even if you've sampled the superb Sonic Mania; it’s clear that a substantial amount of care and work went into making this game, and it’s an excellent love letter to fans of action platformers. Why not just copy and paste the Wii U review? The original Wii U demo piqued my interest resulting in my buying on Steam and being blown away. Corny? Melodramatic? Cartooney? Yes to all the above and frankly those are positives in my book. It kept me hooked and loving almost every minute. The Wii U version followed and now will be buying this version again. Also looking forward to the sequel. I hope this gets a demo like the Wii U version did. I have this on Steam, so I'll probably just play that version, but a physical release on Switch would be something to die for. Played on the Wii U. Never finished it, but I doubt I will doube dip - unless I rack up a bunch of Gold Coins and have nothing else on my wishlist to get. There was a cutscene that would glitch and freeze on you on the Wii U version. Hopefully that’s fixed here. I have the 1st game on Steam. Now I got it on my Switch, it's just still great. I now want Freedom Planet 2 on the Switch. When everyone can make a good sonic game except Sega. I have it on PC and Wii U, so I'm not in a rush to buy it again. I'll get the sequel when that hits the Switch though. I’m not double dipping after having it on Wii U.
I would like the sequel though. I loved it on Wii U, but I'm not interested in double-dipping unless they do a physical release (hopefully with the sequel). I've owned it on the Wii U for forever but have yet to touch it. Hated the Wii U version. The physics feel broken, the levels are way too long, and the long-winded cutscenes are filled with unnecessary dialogue. Now we at Rehashing of what was basically a Sonic clone back in the day. Wonder what all these people will do when there is nothing left at the bottom of the barrel to port over to the Switch. @Agramonte This game is far from the bottom of the barrel, but by all means, dismiss it out of hand because of its origin. @riChchestM because NL doesn’t want Mitch to be poached by IGN? This was one of my favorite games of a couple of years ago, when I picked it up on Steam. Put 40 hours into it, far more than most platformers. I honestly liked it better than Sonic Mania, mainly because of two reasons: (1) the physics are far more forgiving, so it's much easier to control your character at slow speeds (the extra focus on combat works well with that); and (2) the bosses are incredibly well executed (hard, but always dramatic and interesting). One thing I loved about this game is that it feels like they let you go fast. Sonic feels compact and like you have to memorize the levels before you can really go fast. This game feel more open and gives you the freedom to really get up some speed even when it's your first time in the level. That said I've got the GOG version so doubt I'll buy it again, though having it portable would be nice. Does it run well? Any glitches or flaws in the port? In this day and age, if I could make a suggestion @SwitchVogel could we get a performance section of reviews? It doesn't need to be a full digital foundry type thing, just like is the framerate steady, what is the frame rate, were their drops things like that. I got it for free on Wii U, so I'm not gonna buy it again but I'm waiting for the second one. Galaxy Trail did a nice job and the second one seems to go further. 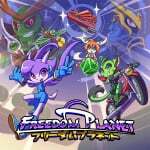 I already know that they have boosted the resolution to 360p for Freedom Planet 2. This is perfect for the Switch because the upscale will be times 2 on the small screen and times 3 on the TV. I didn't come up playing 16-bit Sonic, but did play his early outings some several years ago. They were good, but for some reason I couldn't get the same feels as I did once I played Lilac's quest in FP oddly. FP felt more fun to me. I decided to go back to the Wii U recently and finally finish Carol's story and am working my way through Milla's now. This isn't something I would be double dipping for, but if you're a Sonic fan, there's a chance you will like it for Switch and I recommend it. I'm looking forward to FP2. I love this game and its soundtrack, can’t wait for the sequel! This game proved to me what I've always believed...that Sonic games in general aren't very good. Sonic is a great character but he never seemed to fit in the games made for him. Something as simple as enemies only harming you when they go out of their way to attack you instead of by contact would have made Sonic games flow much better too. I pretty much agree with every word of this review. I lost patience with the Wii U version after dying on a boss so many times, but I'm tempted to double dip just to give it another go on a handheld. you're right on that, my mistake. I should have said " I'm not gonna buy it NOW"
I L O V E this game, definetly worth the double dip, i bought it on launch on wii u, will buy on switch! Whoa, that actually sounds pretty legit. Inspired by Sonic? Oh boy.... Perhaps I ought to save up for this one. I actually loved the story for this one. Just like some of the old Sega CD platformers - the writing and acting were just bad enough to be a lot of fun, without being cringe inducing. I think it was a self-aware choice, well made by the dev. @jmap I don't know about that, as some of the characters such as Lilac have legitimately good voice acting. As the review states, the voice acting is strangely uneven. Still, I agree that the story itself is pretty good, and the chessiness only adds to its appeal. I love the idea (almost a combination of Rocket Knight Adventures and Sonic - two of my favourite Mega Drive games/series) and I think it looks great. I have one major gripe though and it's the physics. 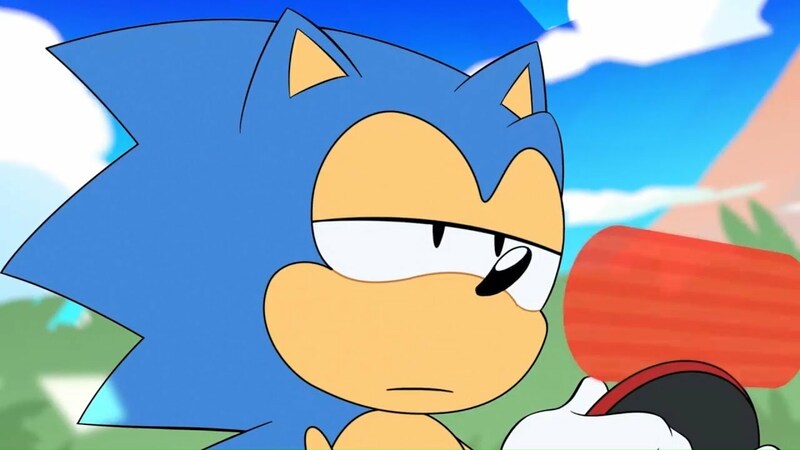 It might be because I played Sonic all my life and I'm used to it, but on the one hand the top speed and acceleration feels off for characters. The other problem I have is that the controls feel slippery. I seem to overshoot stuff. It might just be me though. I do find those issues distracting enough. It's something that can be taken for granted given Classic Sonic style games where everything just 'fits' or comes together nicely. Love this game. Have it both on my WiiU and Switch.